Au Revoir Canal, Thanks for the Memories – Run. Ride. Roam. Today was our final ride along the final stretch of the canal. We set off from our cheap and cheerful hotel, said Au Revoir to the delightful Olga (she was on reception again this morning, she must work really long hours and long back-to-back shifts! ), who wished us a good journey. First stop was to a bio store, so I could replenish peanut butter supplies and Steve could wait in the car park and install his newly purchased replacement bike seat. Success at the bio, with nice peanut butter, jam and crusty bread for Steve. Off we went. Our destination today was the town of Lagnon, where we would catch a train to Bordeaux. We’re doing some calendar watching at the moment because we have to be in Peronne on April 24, in order to make Villers Bretonneux for Anzac Day, so we’ve been deciding how best to get there, which routes to ride, how long it will take and where we may need to leap-frog via train. The first stretch of our ride involved a main road, before we could turn off and resume our canal path route. The trouble with these main roads is…roundabouts! Man-oh-man do I groan when I see a roundabout up ahead, especially if we need to “take the third exit”, which means going all the way around, one handed, sticking my arm out to signal and trying to stay balanced and not toppling over or swerving into traffic, while all the time there are trucks and cars entering and exiting around me. Boooo to the roundabouts! I really do need to get me some indicator lights or a big left and right flag to flip out of my helmet or something, it would make life so much easier! We eventually made it back onto the canal path, which was as peaceful and picturesque as ever and the weather was beautiful once again, hitting about 26C. The path was quite bumpy, due to all the tree roots, but apart from that it was another delightful ride along the canal, through the trees and past farmland. We saw our first paddock of cows! I don’t know why it’s taken this long to see a French cow, but anyway, there they finally were. 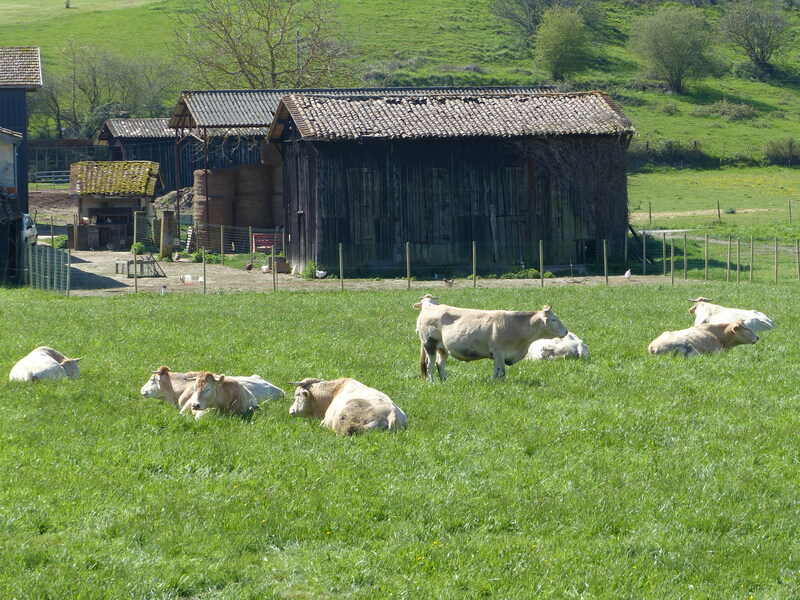 No French bells though, like the Portuguese cows that we could hear donging their bells for miles, these cows were free of musical accompaniment and looked very serene and peaceful lying around their paddock. All too soon, the path came to an end at Castets-en-Dorthe. That was it…the end of the line…no more canal…no more path…all done…over…finished. 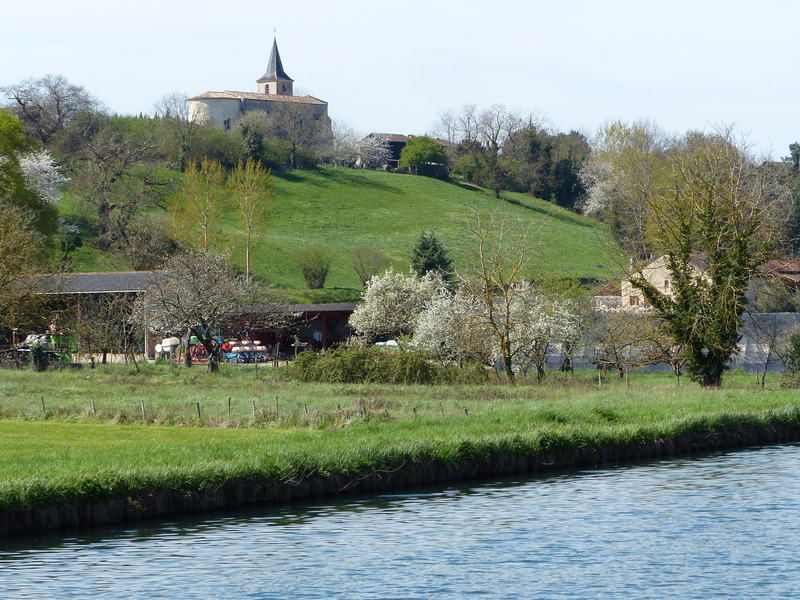 So we had ridden the Canal du Midi and then the Canal de Garonne and it was absolutely delightful all the way. 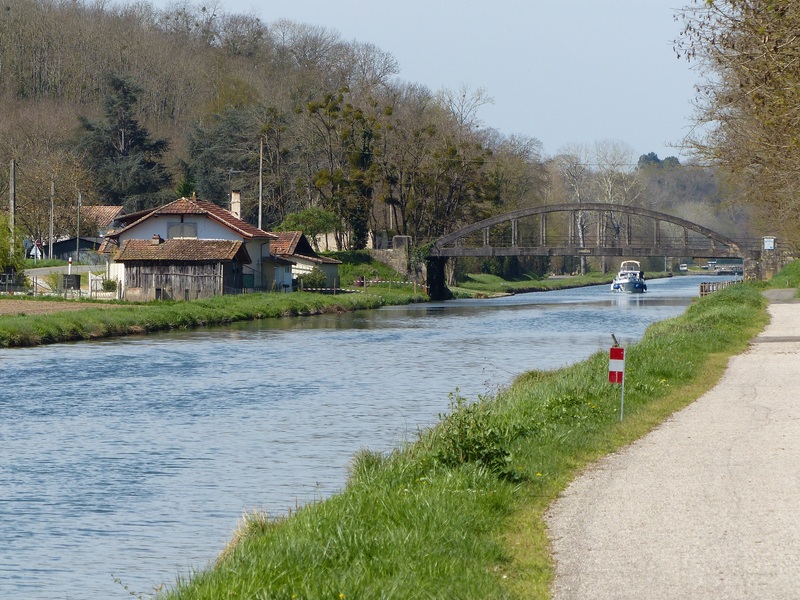 We paused briefly to say ta-ta to the canal and the lovely riding it had given us and then rode on towards Lagnon. …and we made it to the end. 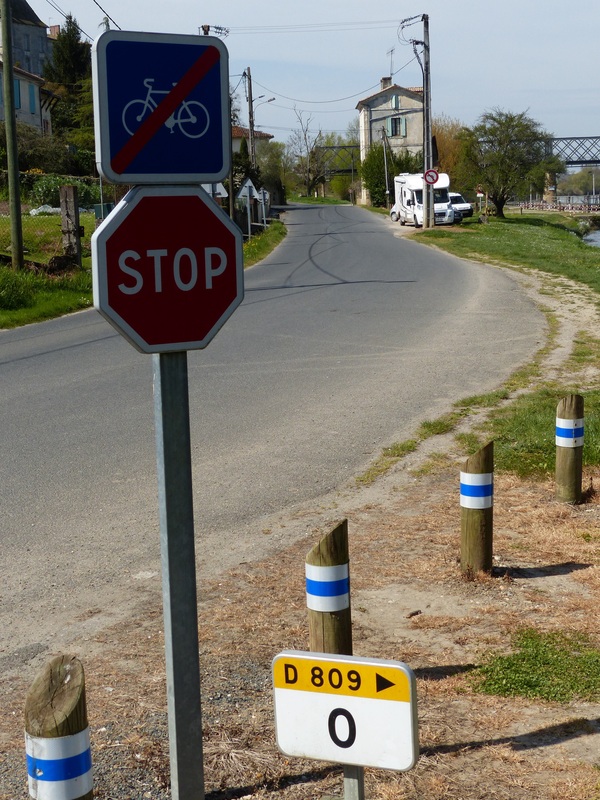 Now, I’m sure you won’t know the answer to this, because it’s a toughie, but I’ll ask it anyway…What do you think greeted us at the end of the canal path, as we took to the road towards Lagnon? Think hard, I’m sure you couldn’t possibly guess! Yes! You’re right, what else would it be…a HILL! Sure enough, the minute we rode off that lovely flat canal path, we were greeted with a steep and winding hill to take us from the canal up into the town. What else could we expect! Down cranked the gears again, oomph went the legs and the legs were certainly having a conversation with me, in a loud and peeved tone! “What’s this! ?” they were saying, “we feel an incline here! This is not on, this will not stand, we’re not having this! We’ve had weeks of respite from such inconveniences and we do not care to resume this unwanted relationship with such rises in the road! Take them away!” Well, the legs could moan and complain all they wanted, but the job still had to be done and the work still had to happen, so I put them to work to quieten them down and we heaved on up the hill. I felt it though! The few hills we had today were nothing compared to what we’ve tackled thus far, but those few days of flat riding left them a bit soft and sooky I think, because the quads were burning! I’m sure everything will get back into the swing of things in no time. We rode into Lagnon and found the train station, where we were lucky enough to make it just before the next train to Bordeaux pulled up, so we headed straight to the platform and straight onto the train and we were away! Perfect timing. 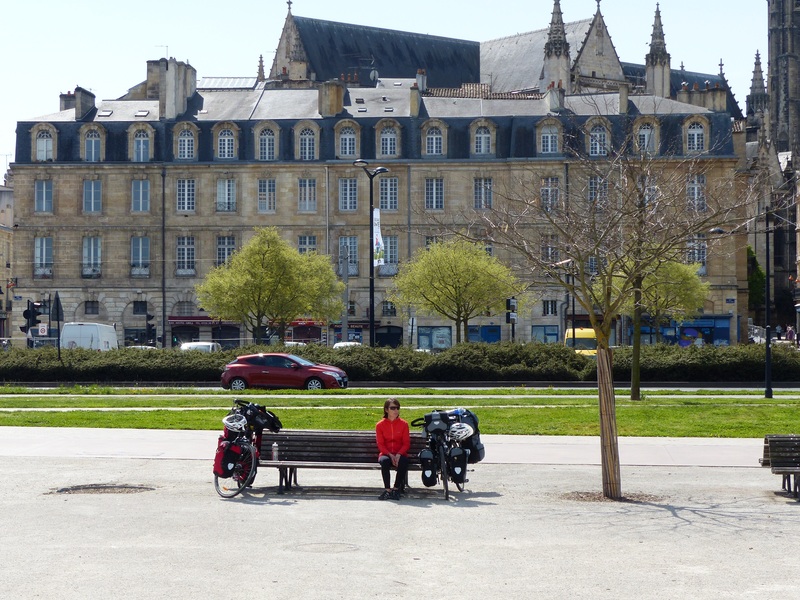 It was a short trip and we soon disembarked in Bordeaux, where thankfully the train station was equipped with escalators and we didn’t have to haul the bikes up any flights of stairs. We sat in the sun near the station while we got our bearings and found a route to our campsite and then we were off again. 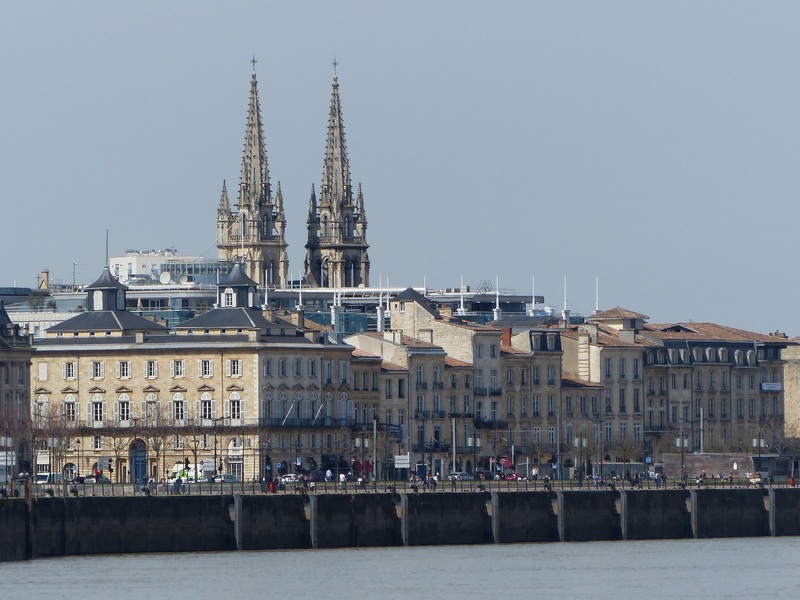 Bordeaux felt like a lovely city, quiet and with some beautiful buildings. 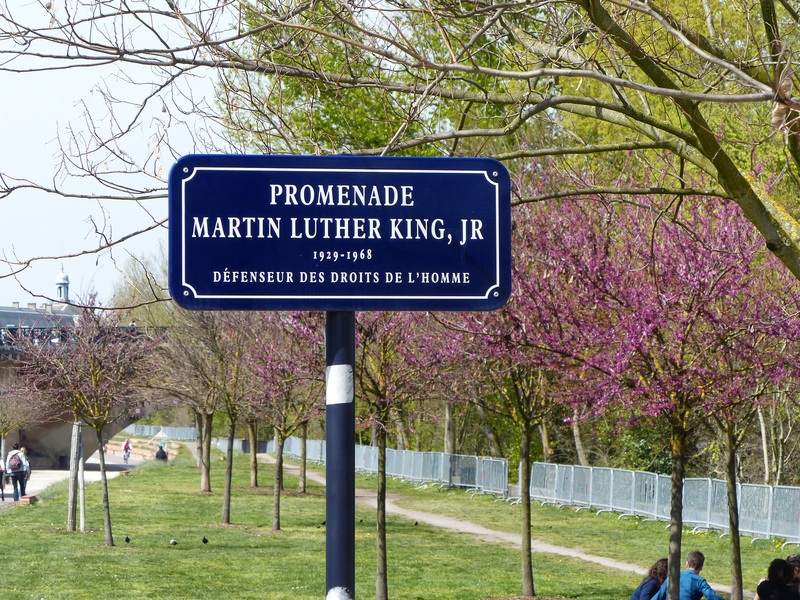 We rode along the wide boulevard beside the water and as it was now 2:30, we stopped to have a quick bite of lunch near the Martin Luther King Jnr Promenade and look across the water. The pigeons were flying around as usual and these pigeons had been provided with their own little house! Pigeons are not generally well thought of, so it was nice to see they had their own little coop to nest in, provided for them by the city of Bordeaux! Just call me Forrest, Forrest Gump. 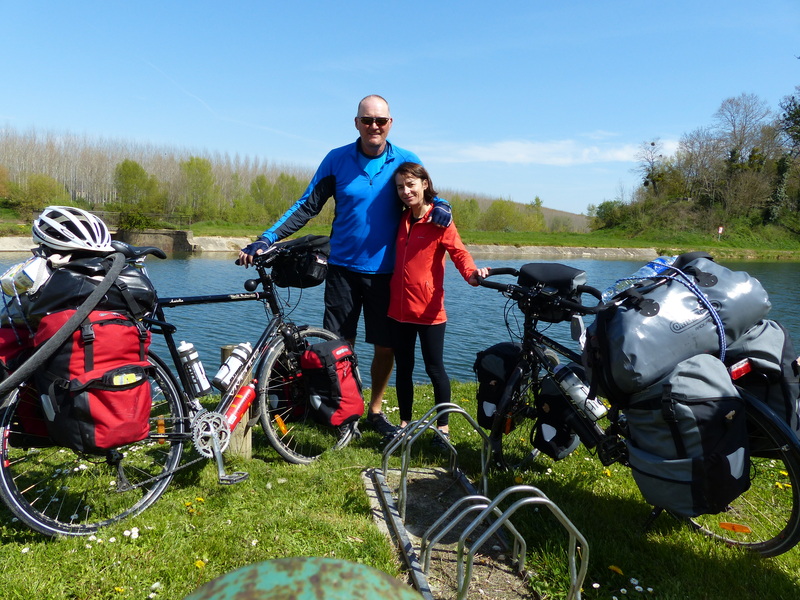 We cycled towards our campsite and found we had a cycle path or cycle lanes the whole way, which was wonderful! No need to signal in traffic and no roundabouts! You little ripper! The campsite soon came into view, right there on the cycle path, so we had made it and have pitched the tent, once more on grass, which is great! The bad news of the day is, Steve doesn’t like his new bike seat and feels it will also give him a pain in the rear-end. Oh dear. We may end up in possession of numerous bike seats from various parts of Europe before we stumble upon the perfect blend of padding and comfort! So now we are back on the open road, heading north without the nice predictability of our canal path. Back to expecting the unexpected! Get ready little bike, get ready legs…we’re set to continue our own Tour de France, with all its ups and downs and the only performance enhancing substances we have are tea and peanut butter! Pedal on…! Hii G! Thanks for that, it sounds like it will live up to my expectations. We’ve done some leap frogging of places in order to have more time around Normandy, the Somme, Villers Bretonneaux etc. just to experience the history and stories. I agree with Giovanna, Villers Bretoneux is moving and humbling regardless of the time of year. However, to be there on Anzac Day will be extremely moving and memorable to say the least. 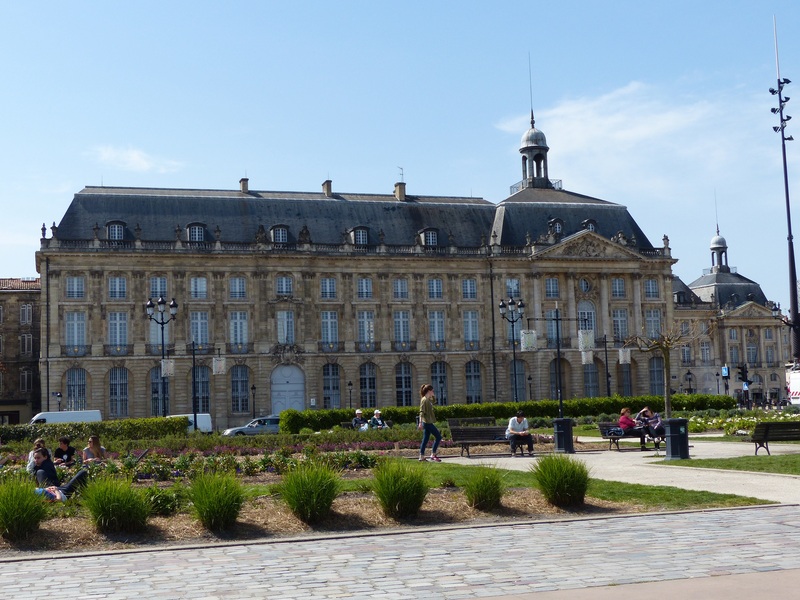 We caught the train from Paris to Amiens and went on the most amazing tour with the most amazing tour Guide – Barbara, who is French but I believe deep down is Australian at heart! Check it out – http://www.trueblue-diggertours.com. Tour includes Adelaide Cemetery in VB, Pozieres, Le Hamel, lovely French countryside lunch and so much more. If you’ve got the time its a tour not to be missed and would also give your legs a rest from pedalling…..
Hi dear Sharen! Thanks for that info, it sounds just wonderful. The history buff in me is really looking forward to exploring the WWI sites and I want to walk in the footsteps of my grandfather too, who fought in France, including the battles on the Somme. We will look into the tours, it sounds like a great way to see the important places and hear the stories too. Thanks for sharing. Hope all’s well in Hobart Town!